Headache is a subjective feeling of pain, crushing, squeezing or stabbing anywhere in the head. They are typically divided to primary and secondary headaches. The most important task emergency physicians have is to exclude any potentially lethal causes of headache. According to some data, around 85% of the adult population experience headaches at least occasionally, and 15% does so regularly. A headache is the chief complaint in around 3-5 % of all emergency departments (ED) visits. The pain in the head originates either from the meninges, blood vessels or surrounding tissues; the brain parenchyma itself is insensitive to pain. Because most of the pain is mediated through the fifth cranial nerve, the patient’s ability to localize the pain is often poor. More specific localization of the pain is associated with specific inflammation in a specific structure (e.g. sinusitis). A vast number of diseases can cause a headache. 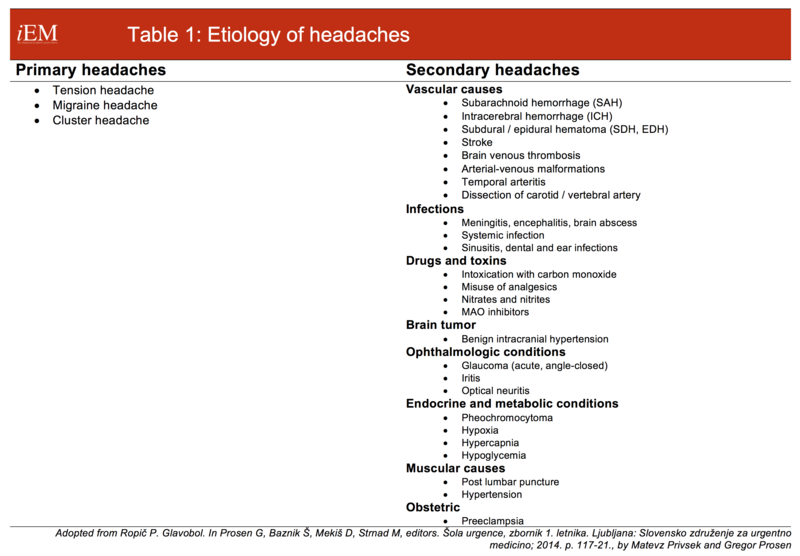 We divide them into primary headaches, in which the headache is the disorder in itself, and secondary headaches, in which headaches are caused by various exogenous disorders (Table 1). Around 50% of patients with a headache in the ED have a tension-type headache, 10% have a migraine-type headache, 8% have a secondary headache, and 30% of headaches remain unknown. It is estimated that less than 1% of patients with headache have a serious, life-threatening underlying disease. A 52-year old male comes to the ED with a severe headache. A triage nurse gives you his chart and says that his vital signs are normal, but he does not look well. You start to question the patient, and the following history is obtained: his headache started approximately six hours ago. He was working in his office when he started to feel squeezing-like sensation in his head. The pain has gotten worse since then, but it is still tolerable. It is independent of any physical activity or position. He already had a few similar episodes of this kind of headache in the past two years, but now the pain does not go away after aspirin as it did previously. He denies trauma as well as any associated symptoms, e.g. no visual disturbances, hearing loss, weakness, dizziness, stiff neck, loss of consciousness. He is otherwise a healthy, non-smoker, with no regular therapy or known allergies. His clinical exam is unremarkable. Conscious, GCS 15, alert and oriented, normal skin color. Blood pressure 135/82 mm Hg, pulse 78/min, 14 breaths/min, SpO2 99%, body temperature 36,4 °C. Neurologic exam shows no declines from normal, as well as the rest of the physical exam. You set up an intravenous cannula, draw blood for testing, and gave the patient some parenteral analgesics (metamizole 2.5 g, ketoprofen 100 mg) along with 500 ml of normal saline. You put him into the observation room. Lab results (complete blood count, basic biochemistry panel) came back in 2 hours and are completely normal. The patient now feels much better, with almost no headache at all. Repeated vital signs and clinical exam are again unremarkable. You explain to the patient that most likely he had a tension headache, warn him about red flags regarding headaches, and discharge him home with a prescription for peroral analgesics with a follow-up at his general physician. Regardless of the patients’ chief complaint, an emergency physician’s first task is assessing a patient’s condition and vital signs, and stabilize him/her, if necessary. After the patient is stabilized, we continue with establishing the chief complaint, precise history, and physical exam, setting the working diagnosis and list of differential diagnoses, and diagnostic and treatment plan. An emergency physician has to exclude life-threatening causes of headache, based on history, physical exam, and diagnostic tests. Subarachnoid hemorrhage (SAH), meningitis, encephalitis, carbon monoxide poisoning, and temporal arteritis considered as critical diagnoses. Other emergency causes of headache are shunt failure, dub or epidural hemorrhage, tumor/mass lesions, mountain sickness, glaucoma, sinusitis, brain abscess, anoxic hedache, anemia, and hypertensive crisis. The leading symptom has to be thoroughly “dissected” and a focused medical history must be obtained. 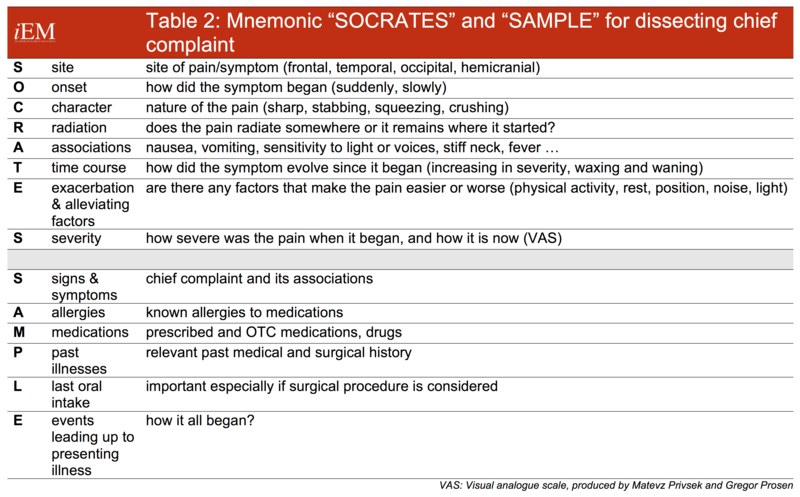 Useful mnemonics for this are “SOCRATES” and “SAMPLE” (Table 2). the severity of headache is not useful to accurately distinguish differential diagnoses; it is more helpful in monitoring the patients’ response to treatment. However, relieving headache with pain medications will not eliminate severe, secondary causes. nausea and vomiting are completely nonspecific and points towards the intensity of the complaint. Tension headache is the most common. Usually, it is bilateral, non-pulsating, and mild to moderate severity, not related to physical activity. Pain is blunt, squeezing-like. It is most common in the afternoon or evening. Migraine starts gradually and can last up to three days. Pain is unilateral, pulsating, and severe, often worse with physical activity. Vomiting, as well as photo and noise sensitivity, often accompany it. Aura (transitional vision disturbances, paresthesias, speech disturbances) can be present before an attack, but it is rare. It is more common in females. Cluster headache is extremely rare (overall prevalence around 0,4%). Its characteristics are extremely severe, unilateral pain, limited to orbital, supraorbital or temporal regions. It is of short duration (few minutes up to two hours), during which the patient cannot be still. 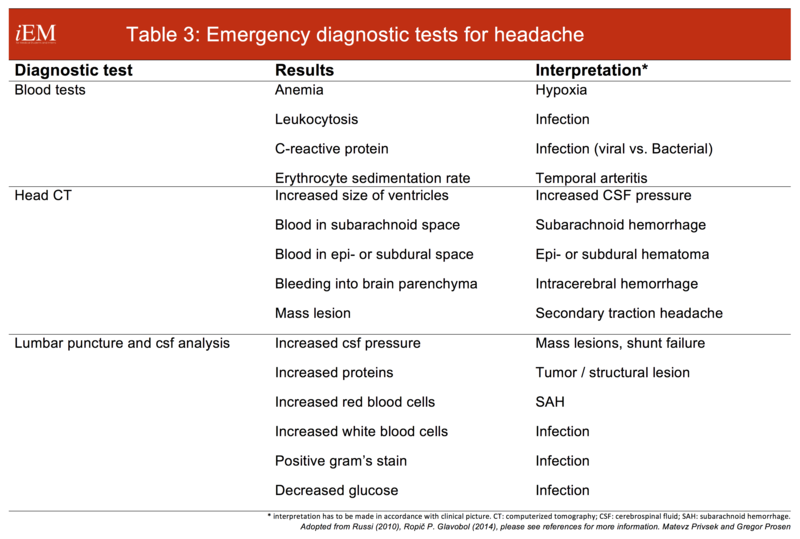 The majority of patients with headache do not require any additional testing. The emergency physician has the following options: blood tests, head CT, lumbar puncture and cerebrospinal fluid analysis (Table 3). It is important to know that head CT scan misses 6-8 % of patients with SAH, its’ sensitivity for detecting SAH is reduced by 10% if the symptoms began over 12 hours ago, and almost by 20-30% if they began 3-5 days ago. What is your opinion about below CT Head images in a patient with acute onset headache? On the other hand, head CT scan within 6 hours of onset of the pain has almost 100% sensitivity for SAH; therefore, lumbar puncture is reasonable only when head CT does not confirm the diagnosis, yet the clinical picture is highly suspicious for SAH. Pain relief is the first and most important important thing of management, at least initially in an undifferentiated headache. Depending on the severity and associated symptoms (e.g. vomiting) we can choose between paracetamol and non-steroid anti-inflammatory drugs, metamizole, and opiates. 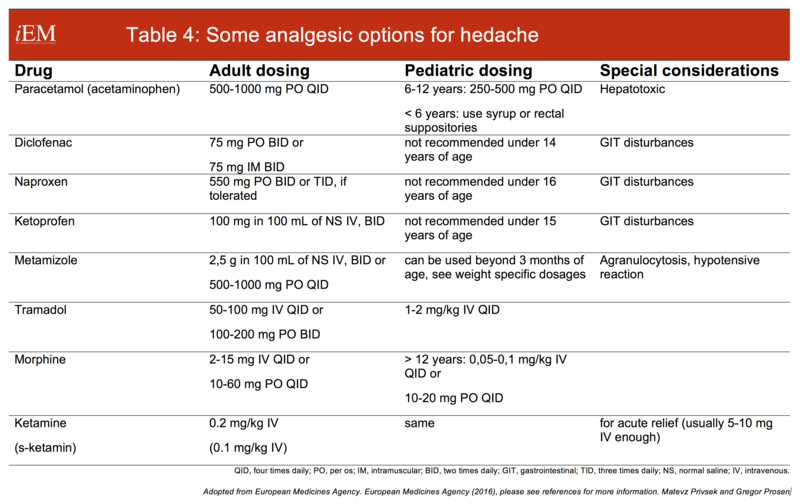 Analgesics can be given per oral or parenterally (Table 4). For specific headache treatment options, see Table 5. Treatment for secondary headaches is directed towards the cause (e.g. surgery, antibiotics, antihypertensives), but we must not forget about pain relief! All the principles for adults can be safely applied to pediatric, geriatric or pregnant patients with headache, with regards to differential diagnosis (e.g. geriatric patient has increased likelihood for a vascular headache). Venous sinus thrombosis should be kept in mind for pregnant and peripartum patients. Sinusitis is one of the common cause of childhood headaches. The vast majority of patients with headache can be discharged home with a prescription for analgesics and a close follow-up. These patients are those in whom ED therapy was successful in pain relief, have normal clinical exam and vital signs, and no serious illness has been identified or suspected. All other patients require additional work-up or admission. Russi CS. Headache. In Marx JA, Hockberger RS, Walls RM, Adams JG, Barsan WG, Biros MH, editors. Rosen’s Emergency Medicine: Concepts and Clinical Practice. 7th ed. Philadelphia: Mosby Elsevier; 2010. p. 118-23. Ropič P. Glavobol. In Prosen G, Baznik Š, Mekiš D, Strnad M, editors. Šola urgence, zbornik 1. letnika. Ljubljana: Slovensko združenje za urgentno medicino; 2014. p. 117-21. Perry JJ, Stiell IG, Sivilotti ML, Bullard MJ, Emond M, Symington C, et al. Sensitivity of computed tomography performed within six hours of onset of headache for diagnosis of subarachnoid haemorrhage: prospective cohort study. BMJ; 2011. p. 343.